Can the U.S. prevent Putin from taking over Eastern Ukraine? 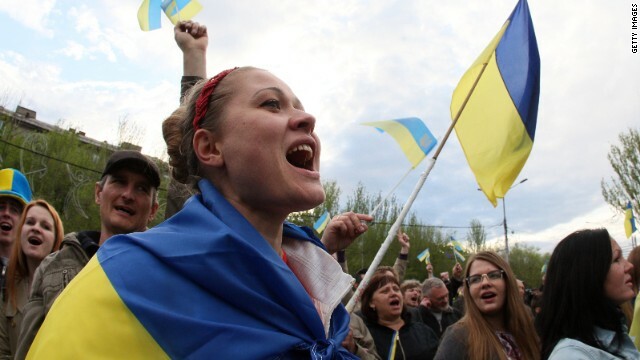 The crisis in Ukraine continues and the overwhelming message from Americans is to stay out. Forty-seven percent of people questioned in a new NBC News/Wall Street Journal national poll say the United States should be less active in foreign affairs. Is the President leading the world stage, or is he stumbling? At 6:30pm ET on Crossfire, Sen. Ron Johnson (R-WI) and Rep. Karen Bass (D-CA) go head-to-head in a debate joined by Newt Gingrich and Van Jones. We want you to weigh in: Can the U.S. prevent Putin from taking over Eastern Ukraine? Let them dump our debt. Let America collapse into bankruptcy so the world will shut up. What those that fear the collapse don't understand is that a collapse of the US dollar also means the collapse of Russia and China. If our dollar collapses we stop buying from from them having a devastating impact on their economy. Its a domino effect and the ones in power, the money hungry 1% know this and will not let it happen. why should usa care ? let these brothers sort it out or fight it out.. we will just watch it n accept the end result..
usa has no place in that area at all.. I believe that the U.S. should be careful how they deal with Russia and imposing sanctions on them. Russia holds 200 billion in our debt and has already hinted they would influence other countries that hold us debt to begin dumping it. China dumped 50 billion in December alone and is Russia closest ally so yes we can impose sanctions on other states, but if countries begin to cash out and our dollar looses its value, we might be in some bad shape. Let them dump our debt. Let America collapse into bankruptcy so the world will shut up. What those that fear the collapse don't understand is that a collapse of the US dollar also means the collapse of Russia and China. Our dollar collapses we stop buying from from them having a devastating impact on their economy. Its a domino effect and the ones in power, the money hungry 1% know this and will not let it happen. So you believe that Russia can afford to dump 200 billion dollars worth of debt? Don't be foolish. What are you talking about!!!!!????? Putin does not involve in what is happening in Ukraine now. Putin and ALL russians are againts war in general and in Ukraine too. Instead, tell Obama to take hands out from Ukraine and stop the war he started. Ukranian "goverment" is killing there own people in eastern Ukraine and Obama is helping them??? It is insane. Please, people, wake up and turn you mind on! Just listen what President Putin is telling. He doesn't want war, he never invade Ukraine and any other countries. Talk to people in eastern Ukraine. They will tell you all truth that is happening over there. Let's look at country leadership in a different way. When a leader pushes to take over another country as Putin is doing, is it not the right thing to do to stop him? When a leader of a country is war mongering and a bully, would it not be easier to simply eliminate that person since their thinking is not peaceful and mature? We have to face the facts, some people will not change there ways. Leaders belong in prison or eliminated when they try to invade a sovereign country that has free elections and treats their people as an asset. Humans really need to grow up and get past corruption, greed and power hunger. President Putin is not pushing for war! He is speaking out to stop war. Neither Putin or Russia in the whole its history never invade other country and it will never do so. President Putin never push to take over another country. He is speaking out against war. Neither Putin or Russian in the whole Russian history never ever invade other country. Russia always was for peace. So we should start in our own back yard I guess. Lets Vote and not for free hand outs but for the better good of humanity. The real simple and quick answer is no the US cannot if its sane. If Russia wants to use its military to go into Eastern Ukraine and take it over, it can without any military push back from the west, because it would be crazy and probably start WW3. However, the west can make Putin pay a lot more than what Ukraine is actually worth. That's the problem with national pride, it becomes more important than reality. The fact is the west is way more powerful economically than Russia is or ever will be. Why fight a ground war that would branch out further than Ukraine, turn Ukraine into dust and possibly have WMD exchanges if someone (Russia) started losing too badly, when you can fight an economic one without bloodshed? One where we can easily win especially if economic sanctions and divestment in Russia is done over the long term, minimizing our exposure. They have already fallen into recession again due to Ukraine. If Russia wants Ukraine, it can pay by toppling itself economically... again. Welcome to the 21st century Russia. Did you ever listen what Putin is saying? He never send army to Ukraine. Ukranian "goverment" is killing eastern Ukranian people. Russia doesn't involve in this. Moreover, Putin and ALL russians are against war and want to prevent it. And it can be prevented only when USA will stop to support Ukranian "government" and force them to stop war.